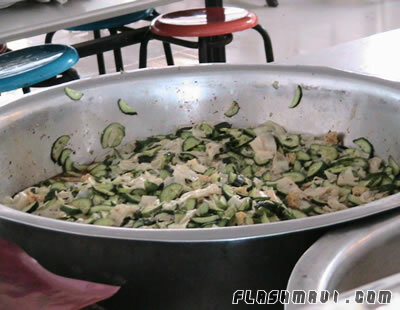 The Food at a Chinese Wushu School ? How is the Food ? 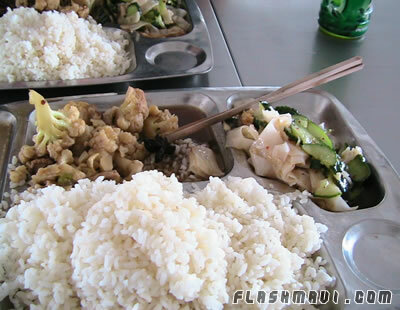 The food at Song Jiang Wushu School is very simple. 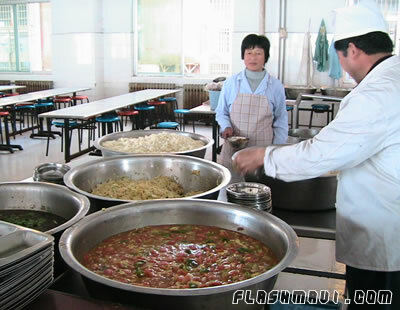 There is a huge lunchroom where over 2000 students can eat at the same time the dishes are very simple. Most foreigners hate the food there, so don't expect the dishes are something like what you can order in a Chinese restaurant in your country. You basically get a metal plate and then the cooks scoop 3 different vegetable and meat mixtures onto it. It doesn't look very clean, but it's the healthiest food you will find in the area. 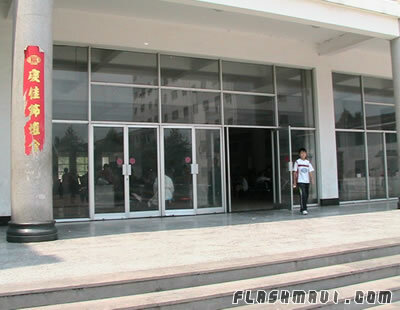 For more information about wushu training in China, Click Here. More: How is the Food ? Most of their dishes look like soup. Sometimes they just serve gherkins with eggs and tomatoes with sugar. So you will really have to get used to this. There are a few different restaurants in the same building. The cheapest one cooks for 60 percent of the students. The cooks of the cheapest restaurant are the friendliest, but the ingredients they use are worse quality. However, the 3 restaurants all cook more or less the same dishes and from my point of view they also taste the same. Advice: How is the Food ? If you need something Mc. Donald's like, ask Mr. Lichen for DICO's. That's a fast food restaurant about 10 to 15 minutes form the school. (at Guang Chang) In Chinese DICO's called "De Ke Shi" They have normal hamburgers and french fries like in America and Europe. You will definitely not get diarrhea from DICO's, but as you know, hamburgers are not really good for athletes. The average menu at DICO's costs 23 Yuan (appr. 2 Euros). There are also some nice restaurants near the Yun Cheng bus station. The food there is like in european style Chinese restaurants, but you will have to try out a few different restaurants before you find one you like. Unfortunately the food there is not much cheaper than in western countries. If you want to eat outside the school, I recommend you buy a bike for 10 or 20 Euros. That will be much faster and cheaper than taking a tri-cycle every time you want to leave the school. You can sell your bike for the same price when you leave after a few weeks / months. 10 to 15 minutes doesn't seem to be far from the school, but if you walk, it will almost take you an hour. In the summer the heat makes the journey insufferable. If you need extra protein, you can ask the ladies with their mobile restaurants at the school's gate. When I am there I usually pay them to cook eggs for me every morning. Most of them have their own chicken farms, so that's the cheapest place to buy eggs. They will hard boil a few eggs for you every day and if you pay a little extra, they will even bring you the eggs to your room. This little service (10 hard boiled eggs) costs approximately 10 Yuan (1 Euro) per day. Of course the exact price of the eggs can go up and down faster than I update this page. If you are eating in cheap restaurants outside the school, you are running risk to upset your stomach. However, at the moment when you decide to go to China, you should accept the idea of having diarrhea from time to time. Chinese hygienic standards are different to western standards. That's why our weak stomachs get upset easily. 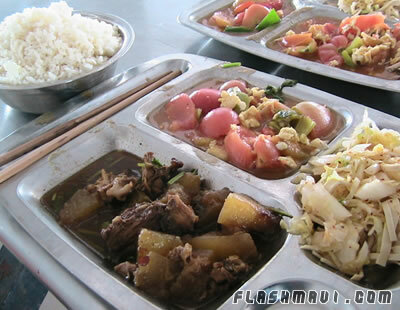 In Yun Cheng, a lot of people eat dog meat. On the way to the school a lot of little restaurants slaughter and barbecue dogs on the sidewalk. Nothing for pet lovers with weak nerves. 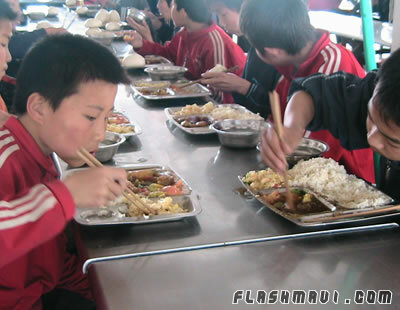 However, the restaurants in the school would never cook dog meat. Pictures: How is the Food ? The cooks preparing to give out lunch. A Chinese tomato & egg dish. 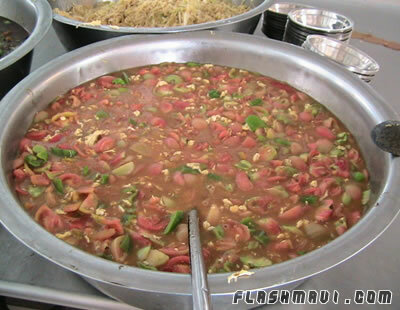 A Chinese gherkin & noodle dish. An average menu at a Chinese martial arts school. 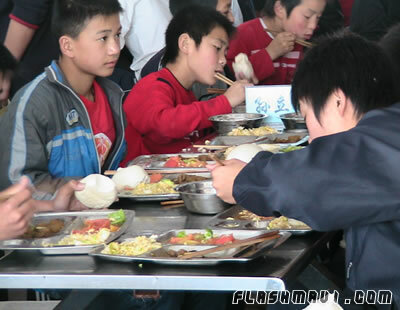 Young students having lunch at Song Jiang Wushu School. 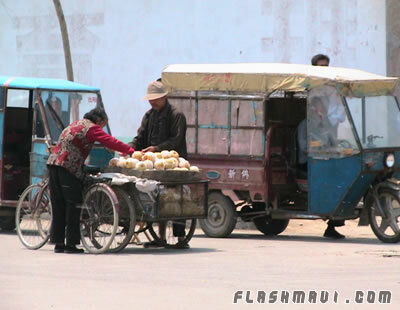 A little Chinese fruit stand outside the school. How much will I train? Can I train in a regular class with Chinese Students? Can I get private instructions? Is there an upper age limit at Song Jiang?